For information on individual state bars, see State bar association. Admission to the bar in the United States is the granting of permission by a particular court system to a lawyer to practice law in the jurisdiction and before those courts. Each U.S. state and similar jurisdiction (e.g., territories under federal control) has its own court system and sets its own rules for bar admission (or privilege to practice law), which can lead to different admission standards among states. In most cases, a person is "admitted" or "called" to the bar of the highest court in the jurisdiction and is thereby authorized to practice law in the jurisdiction. In addition, Federal Courts of the United States, although often overlapping in admission standards with states, set their own requirements for practice in each of those courts. In the typical process, lawyers seeking admission must earn a Juris Doctor degree from a law school approved by the jurisdiction, and then in the states pass an exam administered by the attorney regulating authority of that jurisdiction. Typically, there is also a character and fitness evaluation, which includes a background check. However, there are exceptions to each of these requirements. A lawyer who is admitted in one state is not automatically allowed to practice in any other. Some states have reciprocal agreements that allow attorneys from other states to practice without sitting for another full bar exam; such arrangements differ significantly among states and among federal courts. The use of the term "bar" to mean "the whole body of lawyers, the legal profession" comes ultimately from English custom. In the early 16th century, a railing divided the hall in the Inns of Court, with students occupying the body of the hall and readers or Benchers on the other side. Students who officially became lawyers were "called to the bar", crossing the symbolic physical barrier and thus "admitted to the bar". Later, this was popularly assumed to mean the wooden railing marking off the area around the judge's seat in a courtroom, where prisoners stood for arraignment and where a barrister stood to plead. 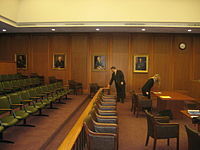 In modern courtrooms, a railing may still be in place to enclose the space which is occupied by legal counsel as well as the criminal defendants and civil litigants who have business pending before the court. The first bar exam in what is now the United States was instituted by Delaware Colony in 1763, as an oral examination before a judge. The other American colonies soon followed suit. By the late 19th century, the examinations were administered by committees of attorneys, and they eventually changed from an oral examination to a written one. In most situations, earn a Juris Doctor from a law school approved by that state (often, but not always, this means accredited by the American Bar Association) (indeed, in certain states, e.g., Arizona, one may not actually take the bar exam unless one's law school is ABA accredited, and this requirement has withstood constitutional attack); or, where permitted, participate in an approved Law Clerk program ("reading the law"). The first law school in colonial America was not established until 1773. Abraham Lincoln is an example of a lawyer who did not attend law school, and did not even read with anyone else, stating in his autobiography that he "studied with nobody". Another telling example is Levi Woodbury, who was the 30th person appointed to the US Supreme Court, yet the first to have attended law school. In all United States jurisdictions except Maryland, Puerto Rico, and Wisconsin, pass the Multistate Professional Responsibility Examination (MPRE), an examination covering the professional responsibility rules governing lawyers. This test is not administered at the same time as any U.S. bar exam. Most candidates usually sit for the MPRE while still in law school, right after studying professional responsibility (a required course in all ABA-accredited law schools), while the material is still fresh in their memory. Some states require that a candidate pass the MPRE before being allowed to sit for the bar exam. Connecticut and New Jersey waive the MPRE for candidates who have received a grade of C or better in a law school professional ethics class. Pass a bar examination, usually administered by the state bar association or under the authority of the supreme court of the particular state. The Multistate Bar Examination (MBE), a standardized test consisting of 200 multiple-choice questions covering seven (7) key areas of law: Constitutional law, Contracts, Criminal law and Procedure, Federal Rules of Civil Procedure, Federal Rules of Evidence, Real Property and Torts. Examinees have three (3) hours to answer 100 questions in a morning session and the same for an afternoon session. The MBE is administered on the last Wednesday in February and July. The Multistate Essay Examination (MEE), a uniform though not standardized test that examines a candidate's ability to analyze legal issues and communicate them effectively in writing. The NCBE provides nine possible MEE questions for each bar exam administration; the UBE uses six of these. This exam is administered on the last Tuesday of each February and July. Topics range from the seven MBE topics above, and include Business law (Agency, Corporations, LLC and Partnerships), Commercial law (Commercial paper, Secured Transactions and the Uniformed Commercial Code [UCC]), Conflicts of law, Estates and Probate (Trusts and Wills), and Family Law. The Multistate Performance Test (MPT), a "closed-universe" test in which each candidate is required to perform a standard lawyering task, such as a memo or brief. The candidate is provided with a case file and a "library" which contains all of the substantive law required to perform the task (plus some non-relevant material). The MPT is administered on the last Tuesday in each February and July. The NCBE provides two MPT questions for each administration; the UBE uses both. The MBE is currently required in all jurisdictions except Louisiana and Puerto Rico. The most recent state to adopt the MBE was Washington, which began using the MBE when it adopted the UBE in July 2013. In jurisdictions that do not use the MPRE, candidates must pass a professional responsibility ("ethics") exam included as part of the main bar exam. Some states, such as Michigan, employ the MPRE and include ethics questions in their main exam. State-specific content is usually included in the examination, such as essays in Washington, Minnesota and Massachusetts. Some states, such as Florida, include both essays and multiple-choice questions in their state-specific sections; Virginia uses full essays and short-answer questions in its state-specific section. Be certified (usually by the state bar association) as having the good moral character and fitness to practice law. Apply to that state's authority responsible for licensing lawyers and pay required fees. Upon approval by that authority, the admittee takes an oath to comply with the rules governing the practice of law in that state, and receives a certificate of admission. In some jurisdictions, e.g., New Jersey, satisfy additional educational requirements; however, continuing legal education (CLE) is generally a matter of license renewal, not admission. Alabama, California, Connecticut, Georgia, Massachusetts, West Virginia and Tennessee allow individuals to take the bar exam upon graduation from law schools approved by state bodies but not accredited by the American Bar Association. The state of New York makes special provision for persons educated to degree-level in common law from overseas, with most LLB degree holders being qualified to take the bar exam and, upon passing, be admitted to the bar. But in certain states (e.g., Arizona), one may not be allowed to actually take the bar exam unless one's law school is accredited by the ABA, and this requirement has withstood constitutional attack: thus, graduates of a law school without ABA accreditation may not sit for the Arizona bar, although they may take the bar in other states. In California, certain law schools are registered with the Committee of Bar Examiners of The State Bar of California. Such schools, though not accredited by either the ABA or the Committee on Bar Examiners, are authorized to grant the Juris Doctor (J.D.) law degree. Students at these schools must take and pass the First-Year Law Students' Examination (commonly referred to as the "Baby Bar") administered by the CBE. Upon successful passing of the "Baby Bar," those students may continue with their law studies to obtain their J.D. degree. Students at law schools accredited by either the ABA or CBE are exempt from having to take and pass the Baby Bar. In California, Tennessee, Vermont, Virginia, Washington, and Wyoming an applicant who has not attended law school may take the bar exam after study under a judge or practicing attorney for an extended period of time. This method is known as "reading law" or "reading the law". New York requires that applicants who are reading the law have at least one year of law school study (Rule 520.4 for the Admission of Attorneys). Maine allows students with two years of law school to serve an apprenticeship in lieu of completing their third year. Most attorneys seek and obtain admission only to the bar of one state, and then rely upon pro hac vice admissions for the occasional out-of-state matter. However, many new attorneys do seek admission in multiple states, either by taking multiple bar exams or applying for reciprocity. This is common for those living and working in metro areas which sprawl into multiple states, such as Washington, D.C. and New York City. Attorneys based in predominantly rural states or rural areas near state borders frequently seek admission in multiple states in order to enlarge their client base. Note that in states that allow reciprocity, admission on motion may have conditions that do not apply to those admitted by examination. For example, attorneys admitted on motion in Virginia are required to show evidence of the intent to practice full-time in Virginia and are prohibited from maintaining an office in any other jurisdiction. Also, their licenses automatically expire when they no longer maintain an office in Virginia. Thirty-two states and the District of Columbia require membership in the state's bar association to practice law there. These states have what is called having a mandatory, unified, or integrated bar. For example, the State Bar of Texas is an agency of the judiciary and is under the administrative control of the Texas Supreme Court, and is composed of those persons licensed to practice law in Texas; each such person is required by law to join the State Bar by registering with the clerk of the Texas Supreme Court. The State Bar of California is another example of an integrated bar as is The Florida Bar. A voluntary bar association is a private organization of lawyers. Each may have social, educational, and lobbying functions, but does not regulate the practice of law or admit lawyers to practice or discipline lawyers. An example of this is the New York State Bar Association. There is a statewide voluntary bar association in each of the eighteen states that have no mandatory or integrated bar association. There are also many voluntary bar associations organized by geographic area (e.g., Chicago Bar Association), interest group or practice area (e.g., Federal Communications Bar Association), or ethnic or identity community (e.g., Hispanic National Bar Association). The American Bar Association (ABA) is a nationwide voluntary bar association with the largest membership in the United States. The National Bar Association was formed in 1925 to focus on the interests of African-American lawyers after they were denied membership by the ABA. Admission to a state bar does not automatically entitle an individual to practice in federal courts, such as the United States district courts or United States court of appeals. In general, an attorney is admitted to the bar of these federal courts upon payment of a fee and taking an oath of admission. An attorney must apply to each district separately. For instance, a Texas attorney who practices in federal courts throughout the state would have to be admitted separately to the Northern District of Texas, the Eastern District, the Southern District, and the Western District. To handle a federal appeal, the attorney would also be required to be admitted separately to the Fifth Circuit Court of Appeals for general appeals and to the Federal Circuit for appeals that fall within that court's jurisdiction. As the bankruptcy courts are divisions of the district courts, admission to a particular district court usually includes automatic admission to the corresponding bankruptcy court. The bankruptcy courts require that attorneys attend training sessions on electronic filing before they may file motions. Some federal district courts have extra admission requirements. For instance, the Southern District of Texas requires attorneys seeking admission to attend a class on that District's practice and procedures. For some time, the Southern District of Florida administered an entrance exam, but that requirement was eliminated by Court order in February 2012. The District of Rhode Island requires candidates to attend classes and to pass an examination. An attorney wishing to practice before the Supreme Court of the United States must apply to do so, must be admitted to the bar of the highest court of a state for three years, must be sponsored by two attorneys already admitted to the Supreme Court bar, must pay a fee and must take either a spoken or written oath. Various specialized courts with subject-matter jurisdiction, including the United States Tax Court, have separate admission requirements. The Tax Court is unusual in that a non-attorney may be admitted to practice. However, the non-attorney must take and pass an examination administered by the Court to be admitted, while attorneys are not required to take the exam. Most members of the Tax Court bar are attorneys. Admission to the Court of Appeals for the Federal Circuit is open to any attorney admitted to practice and in good standing with the U.S. Supreme Court, any of the other federal courts of appeal, any federal district court, the highest court of any state, the Court of International Trade, the Court of Federal Claims, the Court of Appeals for Veterans Claims, or the District of Columbia Court of Appeals. An oath and fee are required. Some federal courts also have voluntary bar associations associated with them. For example, the Bar Association of the Fifth Federal Circuit, the Bar Association of the Third Federal Circuit, or the Association of the Bar of the United States Court of Appeals for the Eighth Circuit all serve attorneys admitted to practice before specific federal courts of appeals. 56 districts (around 60% of all district courts) require an attorney to be admitted to practice in the state where the district court sits. The other 39 districts (around 40% of all district courts) extend admission to certain lawyers admitted in other states, although conditions vary from court to court. Only 13 districts extend admission to attorneys admitted to any U.S. state bar. This requirement is not necessarily consistent within a state. For example, in Ohio, the Southern District generally requires membership in the Ohio state bar for full admission, while full admission to the Northern District is open to all attorneys in good standing with any U.S. jurisdiction. The District of Vermont requires membership in the Vermont State Bar or membership in the Bar of a federal district court in the First and Second Circuits. The District of Connecticut, within the Second Circuit, will admit any member of the Connecticut bar or of the bar of any United States District Court. Persons wishing to "prosecute" patent applications (i.e., represent clients in the process of obtaining a patent) must first pass the USPTO registration examination, frequently referred to as the "patent bar." Detailed information about applying for the registration examination is available in the USPTO's General Requirements Bulletin. Although only registered patent attorneys or patent agents can prosecute patent applications in the USPTO, passing the patent bar is not necessary to advise clients on patent infringement, to litigate patent issues in court, or to prosecute trademark applications. A J.D. degree is not required to sit for the patent bar. Lawyers who pass the patent bar exam may refer to themselves as a patent attorney (rules of legal ethics prohibit lawyers from using the title "patent attorney" unless they are admitted to practice before the USPTO). While patent lawyers have a relevant four-year degree and many have graduate technical degrees, patent litigation attorneys do not have to be patent attorneys, although some are. On the other hand, non-lawyers who pass the patent bar are referred to as "patent agents." Patent agents may not hold themselves out as licensed attorneys. Applicants must have U.S. citizenship, permanent residency (a Green Card), or a valid work visa for a patent-related job. An applicant on a work visa, upon passing the exam, is only given "limited recognition" to perform work for the employer listed on the work visa. Only U.S. citizens can maintain their registration in the patent bar while they are working outside the United States. Additionally, the USPTO requires that applicants to the patent bar have earned a bachelor's degree. Applicants are categorized as having earned an accredited "bachelor's degree in a recognized technical subject" (category A), having earned a "bachelor's degree in another subject" with sufficient credits to qualify for the exam (category B), or having "practical engineering or scientific experience" (category C). Applicants in "category A" must have an engineering or "hard science" degree in a field listed in the General Requirements Bulletin. Note that the degree field as shown on the diploma must be exactly as it appears on the list; for example, "aerospace engineering" does not qualify under category A, while "aeronautical engineering" does. A computer science degree is accepted under "category A" as long as it is received from an Accreditation Board for Engineering and Technology (ABET)-accredited or CSAB-accredited program. Applicants in "category B" must have earned a bachelor's degree, and must have sufficient credits in science and engineering courses to meet the USPTO's requirements; the number of credits depends on the specific discipline. The coursework must include a minimum of eight credit-hours of acceptable classes in either chemistry or physics. Each course being relied upon by the applicant for credit is evaluated by the USPTO's Office of Enrollment and Discipline for suitability; see the General Requirements Bulletin for the details. Engineering and Computer Science majors whose degree programs do not meet "category A" requirements (typically due to the named field of the degree or, especially in computer science, lack of program accreditation) can apply under "category B." Applicants in "category C" may present evidence of passing the Fundamentals of Engineering exam as proof of technical education. They must also have a bachelor's degree. Although the admission requirements allow applicants to substitute proof of technical experience for technical education, this is rarely done in practice. Service as a member of a military service's Judge Advocate General's Corps requires graduation from an ABA-accredited law school, a license to practice law in any state or territory of the United States, and training at the specialized law school of one of the three military services (The Judge Advocate General's Legal Center and School for the Army, the Naval Justice School for the Navy, Marine Corps, and Coast Guard, and the Air Force Judge Advocate General School for the Air Force). In a court-martial, the accused is always provided JAG Corps defense counsel at no expense to the accused, but is also entitled to retain private civilian counsel at his or her own expense. Civilian counsel must either be a member of both a federal bar and a state bar, or must be otherwise authorized to practice law by a recognized licensing authority and certified by the military judge as having sufficient familiarity with criminal law as applicable in courts-martial. The American legal system is unusual in that, with few exceptions, it has no formal apprenticeship or clinical training requirements between the period of academic legal training and the bar exam, or even after the bar exam. Two exceptions are Delaware and Vermont, which require that candidates for admission serve a full-time clerkship of at least five months (Delaware) or three months (Vermont) in the office of a lawyer previously admitted in that state before being eligible to take the oath of admission. New Jersey has a similar requirement, with the addition of training and instruction. On October 12, 2005, the Washington State Supreme Court adopted amendments to Admission to Practice Rule 5 and 18, mandating that, prior to admission, Bar applicants must complete a minimum of four hours of approved pre-admission education. Some law schools have tried to rectify this lack of experience by requiring supervised "Public Service Requirements" of all graduates. States that encourage law students to undergo clinical training or perform public service in the form of pro bono representation may allow students to appear and practice in limited court settings under the supervision of an admitted attorney. For example, in New York's Third Appellate Department, "Any officer or agency of the state ... or any legal aid organization ... may make application to the presiding justice of this court for an order authorizing the employment or utilization of law students who have completed at least two semesters of law school and eligible law school graduates as law interns to render and perform legal services ... which the officer, agency or organization making the application is authorized to perform." Similarly, New York's state Department of Labor allows law students to practice in unemployment benefits hearings before the agency. In addition to the educational and bar examination requirements, most states also require an applicant to demonstrate good moral character. Character Committees look to an applicant's history to determine whether the person will be fit to practice law in the future. This history may include prior criminal arrests or convictions, academic honor code violations, prior bankruptcies or evidence of financial irresponsibility, addictions or psychiatric disorders, sexual misconduct, prior civil lawsuits or driving history. In recent years, such investigations have increasingly focused on the extent of an applicant's financial debt, as increased student loans have prompted concern for whether a new lawyer will honor legal or financial obligations. For example, in early 2009, a person who had passed the New York bar and had over $400,000 in unpaid student loans was denied admission by the New York Supreme Court, Appellate Division due to excessive indebtedness, despite being recommended for admission by the state's character and fitness committee. He moved to void the denial, but the court upheld its original decision in November 2009, by which time his debt had accumulated to nearly $500,000. More recently, the Court of Appeals of Maryland rejected the application of a candidate who displayed a pattern of financial irresponsibility, applied for a car loan with false information, and failed to disclose a recent bankruptcy. When applying to take a state's bar examination, applicants are required to complete extensive questionnaires seeking the disclosure of significant personal, financial and professional information. For example, in Virginia, each applicant must complete a 24-page questionnaire and may appear before a committee for an interview if the committee initially rejects their application. The same is true in the State of Maryland, and in many other jurisdictions, where the state's supreme court has the ultimate authority to determine whether an applicant will be admitted to the bar. In completing the bar application, and at all stages of this process, honesty is paramount. An applicant who fails to disclose material facts, no matter how embarrassing or problematic, will greatly jeopardize the applicant’s chance of practicing law. Once all prerequisites have been satisfied, an attorney must actually be admitted. The mechanics of this vary widely. For example, in California, the admittee simply takes an oath before any state judge or notary public, who then co-signs the admission form. Upon receiving the signed form, the State Bar of California adds the new admittee to a list of applicants recommended for admission to the bar which is automatically ratified by the Supreme Court of California at its next regular weekly conference; then everyone on the list is added to the official roll of attorneys. The State Bar also holds large-scale formal admission ceremonies in conjunction with the U.S. Court of Appeals for the Ninth Circuit and the federal district courts, usually in the same convention centers where new admittees took the bar examination, but these are optional. In other jurisdictions, such as the District of Columbia, new admittees must attend a special session of court in person to take the oath of admission in open court; they cannot take the oath before any available judge or notary public. A successful applicant is permitted to practice law after being sworn in as an officer of the Court; in most states, that means they may begin filing pleadings and appearing as counsel of record in any trial or appellate court in the state. Upon admission, a new lawyer is issued a certificate of admission, usually from the state's highest court, and a membership card attesting to admission. In New York, admission is granted by one of the state's four intermediate appellate courts corresponding generally to the Department of residence of the applicant; once admitted, however, the applicant can practice in any (non-federal) court in the state. In Georgia, each new attorney is admitted to practice by the Superior Court of any county, typically the county in which he or she resides or desires to practice. 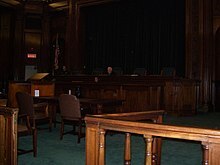 The new attorney, although licensed to practice in any local trial court in the state, must separately seek admission to the Georgia Court of Appeals as well as the Georgia Supreme Court. In most states, lawyers are also issued a unique bar identification number. In states like California where unauthorized practice of law is a major problem, the state bar number must appear on all documents submitted by a lawyer. ^ "Etymology: Bar". EtymologyOnline.com. Retrieved December 11, 2006. ^ a b c "California Bar Examination: Information and History" (PDF). The State Bar of California. p. 3. Retrieved June 27, 2011. ^ "Law School Admission Council "Thinking About Law School? ", page 4" (PDF). ^ a b c d "The Uniform Bar Examination (UBE)". National Conference of Bar Examiners. Retrieved June 30, 2015. ^ a b "General UBE FAQs". National Conference of Bar Examiners. Retrieved April 16, 2014. Click on "Which jurisdictions administer the UBE?" ^ "MBE Jurisdictions". National Conference of Bar Examiners. Archived from the original on February 25, 2013. Retrieved February 18, 2013. ^ "The State Bar of California". www.calbar.ca.gov. ^ "Georgia Bar Admission Rules" (PDF). Archived from the original (PDF) on July 5, 2010. Retrieved November 10, 2010. ^ "The Idiot's Guide to Sitting the New York Bar Exam with a Foreign Law Degree". www.linkedin.com. ^ "Rule 6 Law Clerk Program". Washington State Bar Association. 2002. Archived from the original on April 9, 2003. Retrieved March 4, 2007. ^ "State Special Reciprocity Rules". Online Bar Reciprocity Database. BarReciprocity LLC. Retrieved November 21, 2011. ^ Supreme Court of Virginia. "Rules & Regulations for Admission on Motion". Virginia Board of Bar Examiners. Retrieved April 29, 2010. ^ "Rules for Admission on Motion". Database of Reciprocity and Admission Rules. BarReciprocity.com. Retrieved November 21, 2011. ^ "State and Local Bar Associations". American Bar Association. Retrieved January 8, 2010. ^ See Texas Government Code section 81.011. ^ See Texas Government Code section 81.051. ^ "National Bar Association: The NBA Perspective". ^ "Southern District of Florida - United States District Court". www.flsd.uscourts.gov. ^ "Rule 46. Attorneys" (PDF). Rules of Practice. United States Court of Appeals for the Federal Circuit. June 1, 2011. pp. 86–87. Archived from the original (PDF) on February 15, 2013. Retrieved September 19, 2011. ^ "Survey of Admission Rules in Federal District Courts" (PDF). U.S. District Court for the District of Maryland. 2015. Retrieved 2017-10-16. ^ "Local Rule 83.3 Admission to the Bar" (PDF). Local Civil and Criminal Rules. United States District Court for the Southern District of Ohio. December 1, 2009. pp. 35–36. Archived from the original (PDF) on July 28, 2011. Retrieved December 23, 2009. See specifically Rules 83.3(b) and (c). ^ "Rule 83.5 Admission of Attorneys to Practice in the Northern District of Ohio". Local Civil Rules. United States District Court for the Northern District of Ohio. August 31, 2009. Archived from the original on September 16, 2011. Retrieved October 4, 2011. See specifically Rule 83.5(b). ^ "Rule 57.5 Admission of Attorneys to Practice in the Northern District of Ohio". Local Criminal Rules. United States District Court for the Northern District of Ohio. August 31, 2009. Archived from the original on September 18, 2011. Retrieved October 4, 2011. See specifically Rule 57.5(b). ^ In the Northern District of Ohio, admitted attorneys need not maintain an office in the district, or associate with a local attorney, unless ordered to do so by the court. See Civil Rule 83.5(c) and Criminal Rule 57.5(c). ^ Rule of Court Martial 502(d)(3); United States Joint Service Commission on Military Justice (January 16, 2008). Manual for Courts-Martial (MCM), United States (PDF) (2008 ed.). Archived from the original (PDF) on June 5, 2011. Retrieved December 1, 2011. ^ "Admission to Practice Rule 5". Washington State Supreme Court. Archived from the original on March 4, 2008. Retrieved March 7, 2008. ^ "Admission to Practice Rule 18". Washington State Supreme Court. Retrieved March 7, 2008. ^ "University of Louisville Brandeis School of Law Public Service Requirement". State of New York Courts. Archived from the original on October 25, 2006. Retrieved March 7, 2008. ^ "Part 805: Admission of Attorneys". State of New York Courts. Retrieved March 7, 2008. ^ "Need Help With Unemployment Benefits?". State of New York Department of Labor. Archived from the original on March 11, 2008. Retrieved March 7, 2008. ^ a b "Common Character Concerns: Are You Fit to Admit?". BarAdmit.com. Irwin R. Kramer, Esquire. Retrieved June 12, 2016. ^ Glater, Jonathan D. (July 1, 2009). "Finding Debt a Bigger Hurdle Than Bar Exam". The New York Times. Retrieved September 4, 2010. ^ Glater, Jonathan D. (November 26, 2009). "Again, Debt Disqualifies Applicant From the Bar". The New York Times. Retrieved October 6, 2010. ^ "Application of T. Z.-A. O. to the Bar of Maryland". December 22, 2014. Retrieved June 12, 2016. ^ "Character & Fitness Questionnaire" (PDF). Virginia Board of Bar Examiners. Archived from the original (PDF) on October 8, 2010. Retrieved September 4, 2010. ^ "Admission Rules Section III". Rules of the Virginia Board of Bar Examiners. Virginia Board of Bar Examiners. Archived from the original on October 12, 2010. Retrieved September 4, 2010. ^ "Maryland's Bar Admission Process". BarAdmit.com. Irwin R. Kramer, Esquire. Retrieved June 12, 2016. ^ "Admission Information". The New York State Board of Law Examiners. Archived from the original on November 14, 2010. Retrieved November 9, 2010. ^ "Part B, Section 15. Duty of Judges After Receiving Certificate of the Board" (PDF). Rules Governing Admission to the Practice of Law. Supreme Court of Georgia. January 8, 2010. Archived from the original (PDF) on July 5, 2010. Retrieved November 9, 2010. ^ See, e.g., California Rules of Court, Rule 2.111.